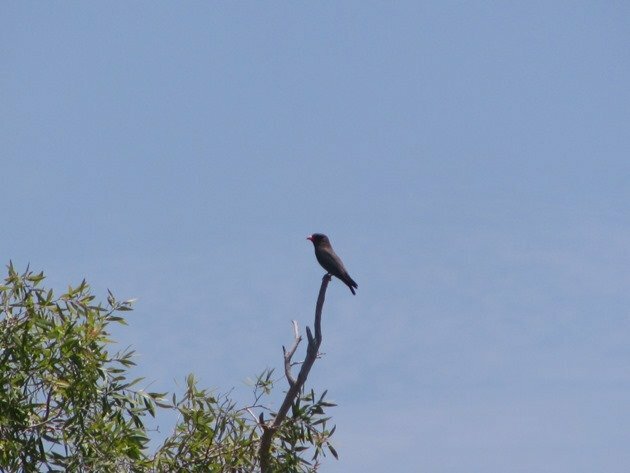 Each September we await the return of the Dollarbird Eurystomus orientalis to the Broome area and it is a lovely bird to observe. It is the only member of the roller family to come to Australia and migrates right down the east coast of Australia, but does not travel much further south than Broome on the west coast. 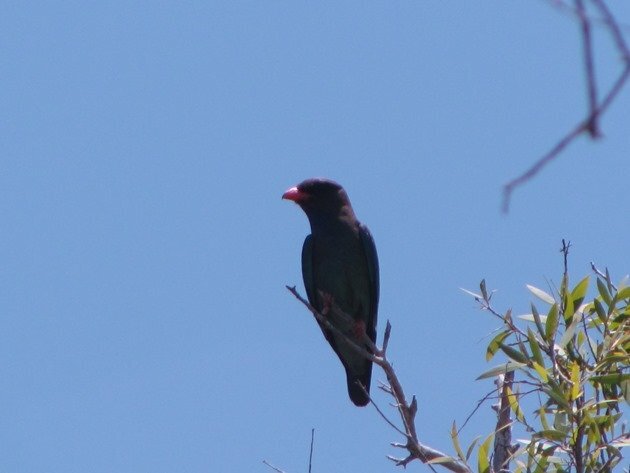 The Dollarbird has a very distinctive flight displaying its large white spots under its wings and its undulating flight is similar to that of the Red-winged Parrot that we observe all year round. Dollarbirds arrive in Australia from the north each year to breed and use hollow trees to nest. To the south of Broome there is a distinct lack of taller trees with hollows and is the most likely reason for them not going further south than Broome when they reach Australia. The adult Dollarbirds are brightly coloured with their turquoise feathers and bright red bills and can often be observed flying low over water at local wetlands as they feast on insects. The Dollarbirds are usually in pairs and perch high on the trees and swoop from their lookout chasing insects. 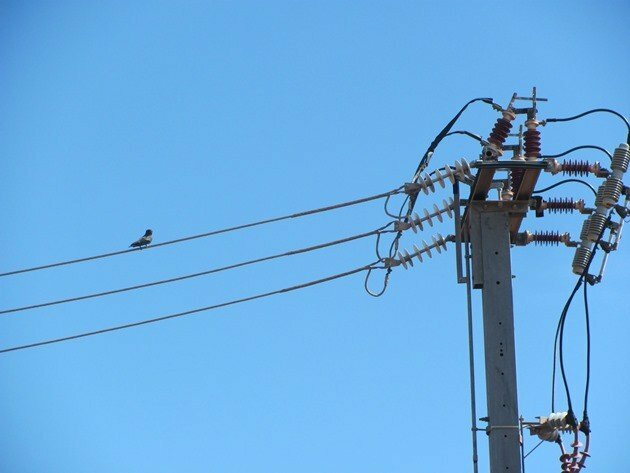 Over the past week we have observed ever increasing numbers of Dollarbirds congregating along the power lines around the coastal area of Broome. Much of Broome’s power is now underground due to the cyclones we sometimes encounter. The Dollarbirds do not roost close to each other, but one Dollarbird per section of power line. The best place to observe them at the moment around Broome is along Kavite Road, which is the gravel road that runs from the port of Broome to Gantheaume Point. At least seven have been observed along that stretch of power line daily this week and they are able to view the ocean from there and contemplate their move to the north. 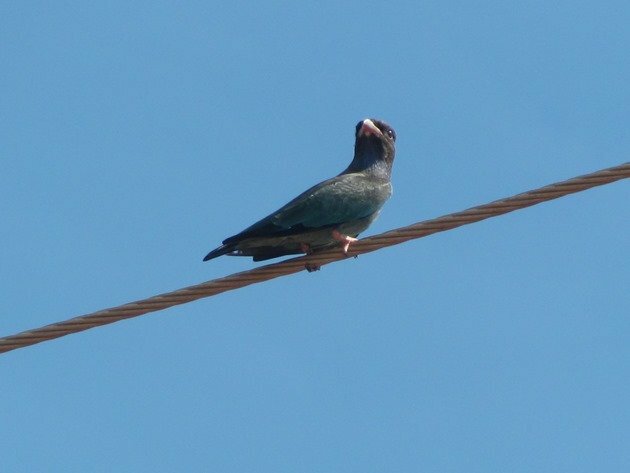 Another equally good area to observe them is the power line that runs along Gubinge Road from Cable Beach Road East to Port Drive where another four Dollarbirds have been roosting on the power lines. Once again they are not in close proximity to each other, but one line apart! The Dollarbirds can’t see the ocean from that power line, because they are positioned just behind the dunes that are Minyirr Park, but must be aware of their location in context to the move northwards in coming days or weeks. There is also a lone juvenile Dollarbird at the corner of Lorikeet Drive and Broome Road and it is also no doubt contemplating the move north. 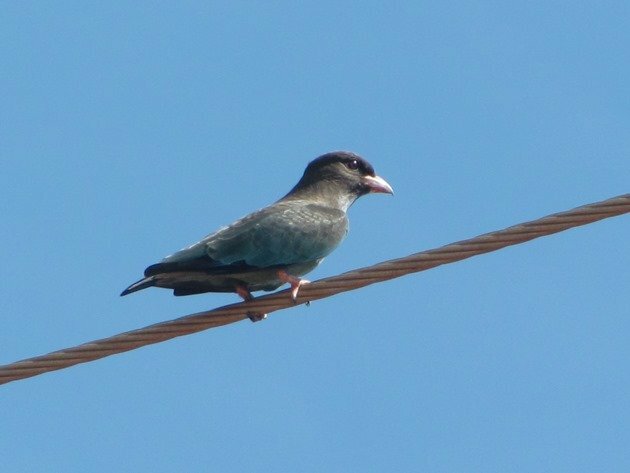 Every day we note the juvenile Dollarbird is still there and we will note the day it is no longer roosting on the power line. It calls out on a regular basis and the sound is quite odd for a bird! It is almost a cough and some fine examples are on this website. 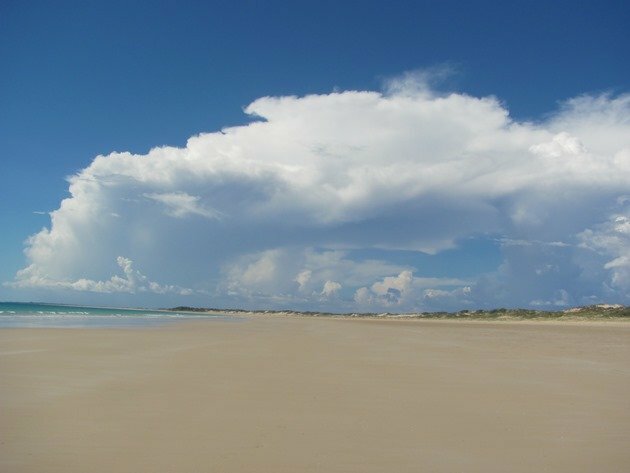 The skies to the north are still offering stormy weather and each afternoon we are greeted by a spectacular sky on Cable Beach. No doubt the Dollarbirds are watching those skies too! 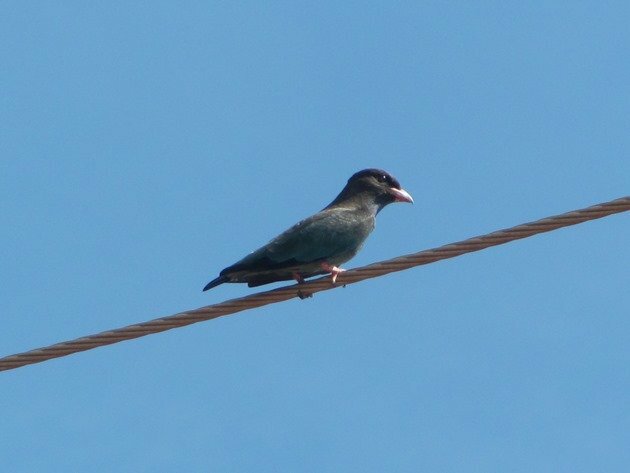 We don’t know if they form a lose flock when they leave or travel independently, but soon we won’t have Dollarbirds on the power lines around Broome. We will miss them! Looking north along Cable Beach this week in the afternoons-the tide is halfway out! We can expect to no longer observe Dollarbirds around Broome by the end of the first week of April, but of course you just don’t know that for sure! In 2012 one lone Dollarbird never went north at all and remained at a nearby wetland until the adults returned from the north in September that year. 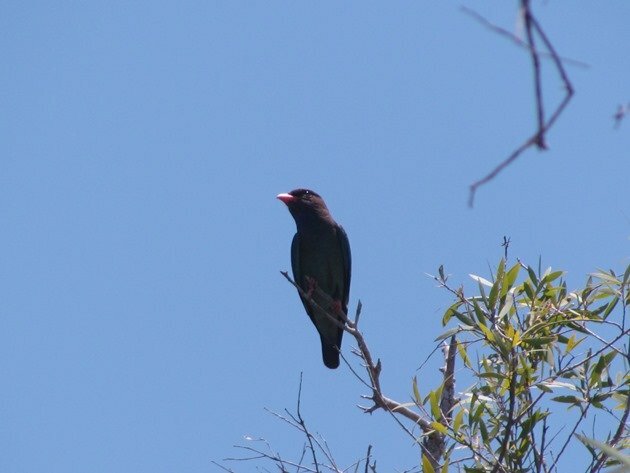 When did you last observe a Dollarbird this year? Have they already left your area? If you live north of Broome do you notice the Dollarbirds depart as well? UPDATE:- April 15th there are still Dollarbirds around Broome! None have been observed since around Broome, but one adult remains at Ellendale Dam April 25th. I was thrilled to see a Dollar Bird in Assam. It was perched on a power line outside of Kaziranga NP (or, over an area of Kaziranga not open to the public but visible from a road stop). It was a scope view, and, as you say, it would swoop off to chase insects, and then return. I love the name “Dollar Bird.” Wikipedia says it derives from “the distinctive blue coin-shaped spots on its wings”.